(Nanowerk News) Metamaterials allow design and use of light-matter interactions at a fundamental level. An efficient terahertz emission from two-dimensional arrays of gold split-ring resonator metamaterials was discovered as a result of excitation by a near-infrared pulsed laser (Nature Communications, "Broadband terahertz generation from metamaterials"). A metamaterial that consists of a two-dimensional array of U-shaped gold structures (square background in the picture) efficiently emits terahertz frequency electromagnetic waves (red axis) when illuminated by a wavelength tunable near-infrared pump laser (blue axis). Terahertz waves are used in non-invasive imaging and sensing technology, in addition to information, communication, processing, and data storage technologies. Despite their widely recognized importance, however, there are few terahertz sources presently available due to the limitations of natural materials. This discovery opens new ways to use metamaterials for these important applications. 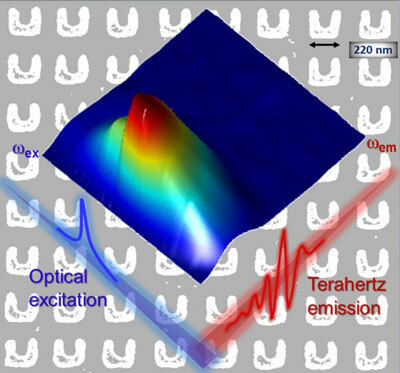 Broadband terahertz sources offer exciting possibilities to study fundamental physics principles, to develop non-invasive material imaging and sensing, and make possible terahertz information, communication, processing, and storage. The terahertz spectral range sits between infrared and typical radar frequencies, and the challenges of efficiently generating and detecting terahertz radiation has limited its use. To solve these challenges consider metamaterials; materials that allow control of the properties of light-matter interactions at the fundamental level. The building blocks of metamaterials, known as split-ring resonators, can be designed to exhibit strong electric and magnetic response to electromagnetic fields over a wide frequency range, from terahertz to infrared. Scientists at Ames Laboratory, Iowa State University, and Karlsruhe Institute of Technology in Germany have discovered that when a two-dimensional array of nanometer-sized gold metamaterial resonators is illuminated by a tunable near-infrared femtosecond laser, with wavelengths matching the magnetic resonance of the metamaterial, a strong broadband of terahertz electromagnetic waves is emitted. The efficiency of this conversion to terahertz waves was significantly better than conventional materials that are presently used for these applications. Detailed analysis of the directionality and polarization of the emitted radiation reveals the fundamental nature of this efficient wavelength conversion. Further, these new metamaterials could allow integration of terahertz optoelectronics with high-speed telecommunications.